Going to a New Year’s Party? Baked Brie has been one of my favorite potluck contributions for years, because it’s so easy and always popular. How to do it: Open the brie. Open the crescent rolls and roll them out flat. 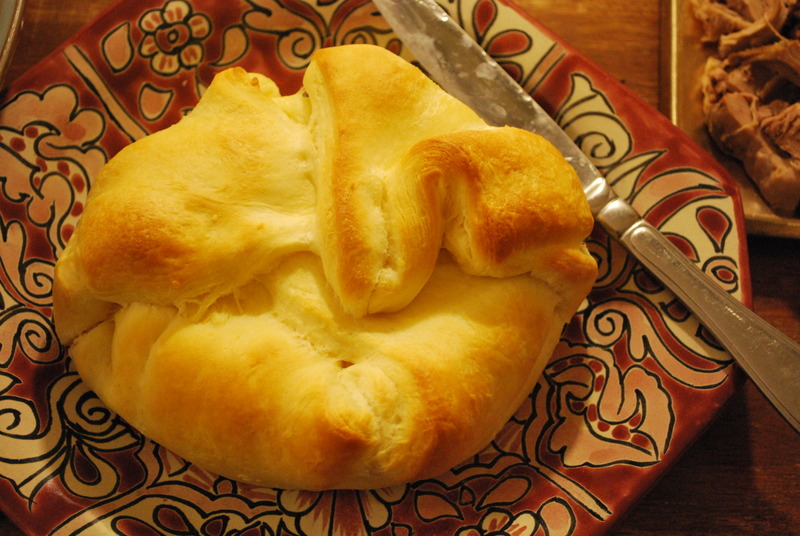 Put in brie in the middle of the flat piece of dough and fold the dough up over the top. Some people spread jelly or chutney over the top of the brie before wrapping up the dough, but we had several kinds of chutney to sample with the cheese, so served those separately. Make sure to squish it together so there are no holes. Bake at 350 degrees til the dough looks browned and the cheese is melted inside, about 10-15 minutes. If you overbake it, the cheese can become liquid and spill all over the place, so be careful. Previous post ← Holiday Cheer! Marty I use leftover fish-(or cook extra)-mostly trout-(that’s mostly what’s available) Kokanee works fine and perch as well.